The world of publishing is changing in some big ways. Self-publishing is now a feasible option for writers and artists. But with our newly gained access to design software, Print-on-Demand services, and distribution options, what does it mean to publish a book? 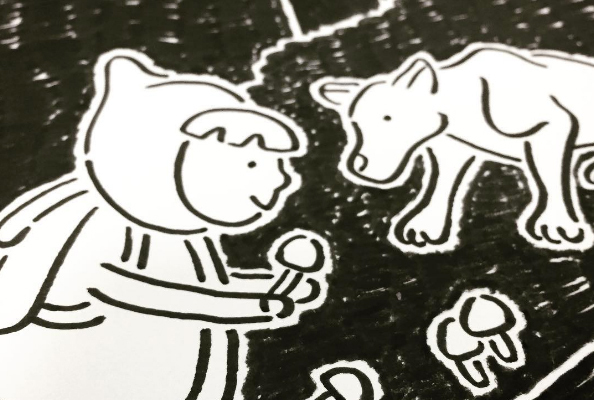 In just a couple weeks, my children’s picture book, We Are Fungi, will be self-published. I spent over 2 years making this book. But why? A book that exists in more than just one copy and can be obtained by an audience. It isn’t the photo journal you made of your new puppy, or the one-off zine that got buried in your desk drawers. It’s a book that was made with the intention of being produced multiple times and distributed to multiple people. If the book is distributed to enough people, it somehow becomes a part of the world, a part of our shared knowledge and mentality. The book is put out into the world, and with some luck, the world sees it. Making a book is an act of creativity. But publishing a book is much more. Publishing a book is an entrepreneurial act. It’s throwing your book out into the world with the confidence that it will resonate with someone, somewhere. It’s not just making a book and leaving it in the drawer. It’s making a book and releasing it into the wild. Self-publishing used to be a dirty word in the book community. To some people it still is. It’s sometimes looked down upon and called Vanity Publishing: just paying to print a book that doesn’t deserve to be made. Self-publishing is becoming an avenue for artists to take control of their career, experiment, and embrace entrepreneurial risk. We can publish our own books. We can have the freedom of control. We can proclaim our books as worthy. We can bring our books into the world. We can do it ourselves. We also shoulder all the risk. My two years of work on this book could all be a waste if my goal is to sell thousands of copies, get on a bestseller list, and make a million bucks. But that’s not my goal. Publishing a book is an act of sharing. A publishers ultimate goal is to make money. That’s what companies do, and how they survive. But I’m not a company. I’m an artist. A person. And my goal is to connect with other people. To share my stories and thoughts with other people. Self-publishing allows me to share the stories I want to share. I can choose to write something new and original. Something weird. 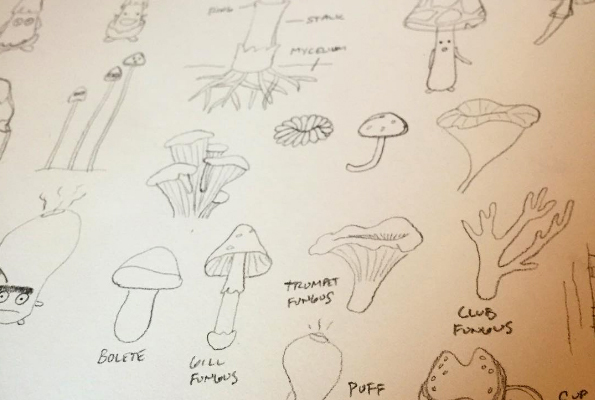 Something for a tiny, niche market like people interested in fungi. To write a creepy, dark-ish book starring a female character. To write a nonfiction book that has mythical-like creatures. To write a story told in words, that pairs with a different story told in pictures. To focus on the story and the reader rather than making an artifact type book that costs $30. To see the whole thing from start to finish. I’ve worked extremely hard and long on this book. I don’t know what will happen when I release it. Perhaps it will flop and get buried in the depths of the internet. But I’m not doing this to become a rich, bestselling author. I’m doing this because I love to do it. I love to make books, and I love to share them with people instead of hiding them. Because I’m tired of hiding them. I’m ready to share my book now. 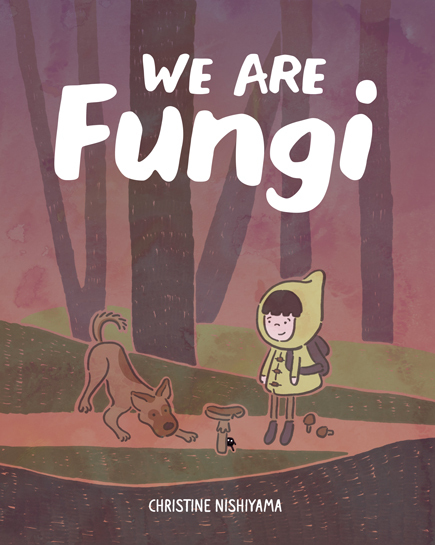 Find out more about We Are Fungi! 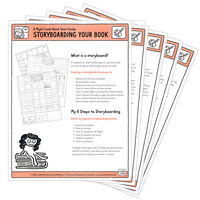 Learn how to storyboard your book! Get my Quick Start Guide to Storyboarding Your Book so you can finally start making that book you've been thinking about! Plus get my storyboard templates so you can start storyboarding right away!